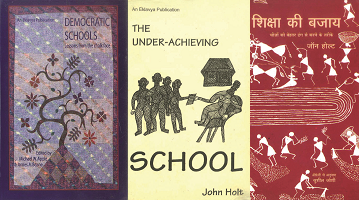 These books are based on the bitter truth, critical analysis and picturing the realities of the mainstream education system all around the world as well as in India. The stories collected from outside of the country have been translated in Hindi in most cases. Many of the stories have a highlight on democratic schools and also schools based in rural areas in India and abroad, and pictures the role the educational practitioners, teachers and schools play in kids’ lives. How such individuals mould the personalities of the kids and shape their careers is depicted in the books, not the kind of true stories easily available in Hindi language. एक अनोखे प्रायोगिक स्कूल की कहानी। इस स्कूल में वह सब सामान है जो बच्चों के पढ़ने या सीखने के लिए ज़..
यह पुस्तक न्यूजीलैंड के माओरी बच्चों की शिक्षा को समर्पित एक अध्यापिका के जीवन अनुभवों का निचोड़ और ..
A collection of interesting and useful science activities for teachers. Well-organized, illustrated ..
Arthshashtra Ka Marm Kya Hai? एन.सी.ई.आर.टी. में दिए इस व्याख्यान में जीवन के दैनिक उदाहरणों की मदद से अर्थशास्त्र के उन केन्द्रीय.. The author vividly puts the specific problems prevalent in the education system that are a major det.. This volume is a compendium of various monthly meetings and seminars organised by the National Cent..
What happens in our classrooms? Why are children not able to use their potential to the fullest? Why.. The author delves deep into the children’s understanding of government or sarkar, how they perceive ..
शिक्षा पर यह एक महत्‍पवूर्ण पुस्‍तक है। लेखक ने अपने अध्‍यापक जीवन के दौरान किए गए प्रयोगों के..
जो विषय वयस्कों को कठिन लगते हैं या जिन समस्याओं से जुड़े प्रश्नों का उत्तर खोजना वयस्कों को मुश्किल..
जिस साहसिक कार्य में शामिल होने का निमंत्रण यह पुस्‍तक हमें देती है, वह है बचपन से सम्‍बंधित ज्ञान क..
John Holt has extensively written about children and schooling. This book offers his views on the ri..
Eklavya is a non-profit, non-government organisation that develops and field tests innovative educational programmes and trains resource people to implement these programmes. It functions through a network of education resource centres located in Madhya Pradesh.